French President Emmanuel Macron on Monday vowed to rebuild Notre Dame Cathedral in Paris, after a colossal fire caused the spire of the historic edifice to crash to the ground and wiped out centuries of heritage. 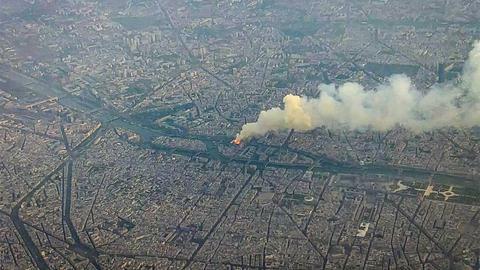 A spokesman for Paris firefighters said on Tuesday that "the entire fire is out." 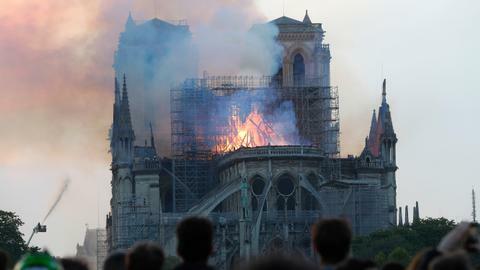 Paris fire brigade chief Jean-Claude Gallet said, "We can consider that the main structure of Notre Dame has been saved and preserved" as well as the two towers. Deputy Interior Minister Laurent Nunez, also present at the scene, said that for the first time "the fire had decreased in intensity" but still urged "extreme caution." "Notre Dame survived all the wars, all the bombardments. We never thought it could burn. 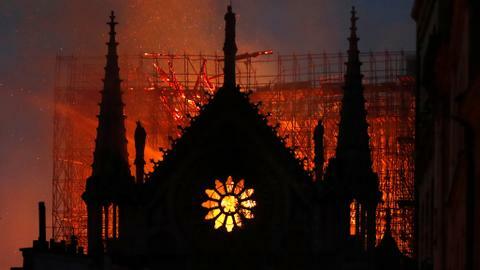 I feel incredibly sad and empty," Stephane Seigneurie, a consultant who joined other shocked onlookers in a solemn rendition of "Ave Maria" as they watched the fire from a nearby bridge. Gasps and cries of "Oh my god" erupted around an hour after the fire first broke out when the top portion of the church's spire came crashing down. The spire extended 96 metres high (315 feet). Comparing the mood in the French capital to the aftermath of a terror attack he said, "But this stirs much deeper emotions because Notre Dame is linked to the very foundations of our culture." The cause of the blaze was not immediately confirmed. The cathedral had been undergoing intense restoration work, which the fire service said could be linked to the blaze. TRT World speaks with art historian Elizabeth Lev. 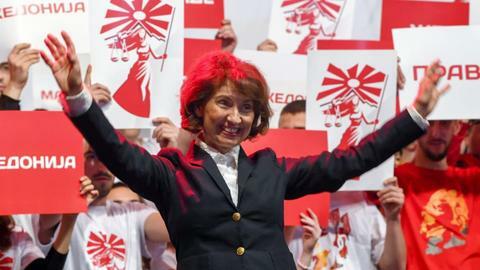 Macron had cancelled a major televised policy speech he was due to give on Monday evening to respond to months of protests, and instead headed to the scene in person. 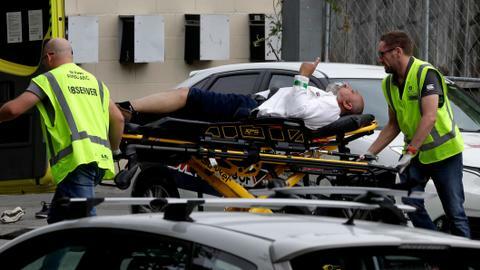 Visibly emotional, he said while the "worst had been avoided" and the facade and two towers saved "the next hours will be difficult." "And we will rebuild Notre Dame because it is what the French expect," he said, describing Notre Dame as "the epicentre of our life" and the cathedral of "all the French," whether religious or not. French oil giant Total on Tuesday pledged $113 million or 100 million euros towards the rebuilding, bringing the amounts pledged to nearly half a billion euros. "The destruction of this masterpiece of architecture is a catastrophe for the entire humanity," said Turkish Foreign Minister Mevlut Cavusoglu. 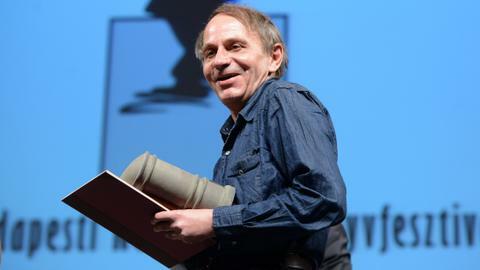 It would go on to feature as a central character in a Victor Hugo novel published in 1831, "The Hunchback of Notre Dame" and shortly afterwards a restoration project lasting two decades got under way, led by architect Eugene Viollet-le-Duc. It would survive the devastation of two world conflicts in the 20th century and famously rang its bells on August 24, 1944, the day of the Liberation of Paris from German occupation at the end of World War II. Elena Casas joins TRT World and reports from the French capital. The cathedral was located at the centre of the French capital in the Middle Ages. Fire trucks could be seen speeding on Monday evening through Paris towards the scene on the Ile de la Cite – an island in the Seine at the heart of Paris. A burning smell filled the air and the evening sky lit up bright orange as the massive fire tore at Notre Dame Cathedral. The first stone of the Notre Dame de Paris ("Our Lady of Paris") Cathedral was laid in 1163 in the reign of Louis VII, as the medieval city of Paris was growing as a political and economic centre of the kingdom of France. Dominating the structure are its two 13th century bell towers. The so-called "bourdon," the largest bell, goes by the name of "Emmanuel." The 387 steps up to the towers take visitors past the gallery of chimaeras, mythical creatures typically composed of more than one animal. The most famous of these, the "Stryge" gargoyle sits atop the cathedral watching Paris with its head resting in its hands. French writer and historian Camille Pascal said, "We can be only horrified by what we see." Pascal told French broadcaster BFMTV, "It's been 800 years that the Cathedral watches over Paris" and its bells pealed for both "happy and unfortunate events."